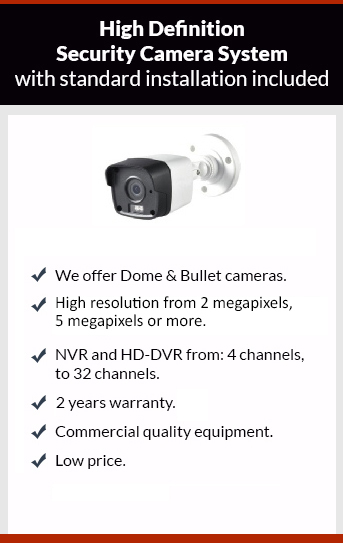 Get affordable Security Camera Installation on La Puente, CA and CCTV equipment with commercial quality and 2 years warranty. Security camera DVR can record all the time or with motion detection. Motion detection is one of the most important features in a security camera. DVR software detects movement or changes on light within the security camera’s field of view, and start to do the recording. In some professional DVRs the sensitive of the motion recording can be adjusted, or customized to the customer needs. Sensor motion is really important to locate events; the system can tell you at what time and what day a security camera registered a movement. If we are looking for something specific is easy to locate it in the DVR in this way. There is something called motion detection mask; with this feature we can programing the DVR of the security camera system to detect motion only in a part of the camera’s field of view. In the security camera systems DVR we can change the picture settings of the system like, color, bright, contrast, name of the camera, change location of each camera on the monitor etc. When you get your security camera system from Protection4less you’ll be sure that the all the settings of the system will be adjusted according to your needs, besides this you’ll get top of the line quality on CCTV equipment and professional installation. Call today to get your appointment, the estimate is free.